Immigration detainees at two compounds of Yongah Hill (outside Perth) have begun a hunger strike (Monday 14 January) in protest against detention conditions. On the night of Sunday 13 January, the Yongah Hill protesters rallied outside their accommodation blocks. On Monday, over 350 people began a hunger strike protest to draw attention to the conditions, the mistreatment and the abuses in Yongah Hill. 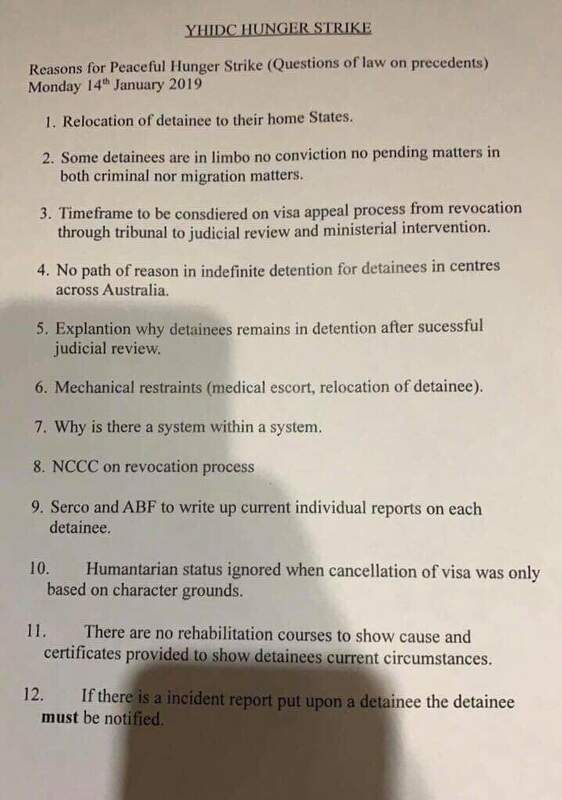 The Yongah Hill protesters have issued a statement (below) with a list of their concerns, raising many issues regarding long term detention injustice, visa cancellations, as well as abuse by Serco guards, and the arbitrary arrest powers and internal punishment regime that operates in immigration detention. The routine use of handcuffs that has become part of Border Force’s militarisation of detention is a particular concern. Below is a video clip of a detainee handcuffed in a Perth hospital after self-harm incidents. In both MITA and Yongah Hill, protesters have disappeared into punishment cells inside the respective detention centres. One Yongah Hill detainee who staged a roof top protest was taken to the punishment cells on 9 January, and has not been seen since. 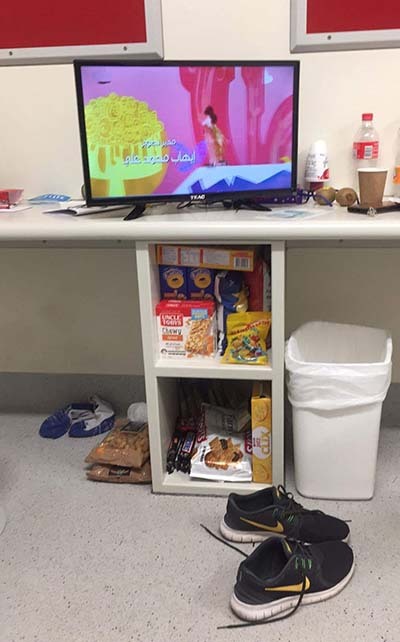 Meanwhile, the hunger strike at Melbourne’s MITA North detention compound has been suspended after Border Force met one of the detainees’ demands, providing TVs for the detainees’ rooms (see photo). However, tensions remain; the TVs are only in one compound and as yet have no antenna connection. And the detainees are still waiting for chairs to be brought into the compound and for the midnight lockdown to be lifted. And there other outstanding issues about detention conditions to be addressed. Two people in MITA have attempted suicide (one by eating a razor blade) since Friday last week, and one hunger strike protester has been taken to the punishment cells. MITA protesters are still waiting for action to be taken against guards involved in an alleged assault on two asylum seekers in MITA South last week, video of which was caught on mobile phone cameras and has been widely circulated. “The protests in MITA and Yongah Hill are shining a long-needed light onto the abuses in on-shore detention. Detention centres have become places of extra-judicial punishment with the Minister and Serco guards invested with arbitrary and abusive powers. They should closed, ” said Ian Rintoul, spokesperson for the Refugee Action Coalition.